SideSwiper Net -- SSN: Home. James (Jim) Barrett, K3CKT, Silent Key. Our good friend James Ivan (Jim) Barrett, K3CKT, has become a Silent Key. James Ivan (Jim) Barrett, K3CKT, passed away in his home (Takoma Park, Maryland) on March 7, 2019. He was 88 years of age and would have been 89 in June of this year. He has been running the SOWP and the SSN nets for many years on a regular basis. Our deepest sympathy to James Ivan (Jim) Barrett's family and friends. Kees van der Werf, PA3DEB, Silent Key. Our good friend Kees van der Werf, PA3DEB, has become a Silent Key. Kees van der Werf, PA3DEB, passed away at age 68 on April 7, 2019. I first met Kees in the early 80's on 3553 kHz which was a hangout for CW-men in the Netherlands and in Belgium then. Kees has Always been CW fan, ever since he was licensed. We became friends and I frequently visited his house in Feanwâlden. As Frisians we often made a CW QSO in Frysk which is very unusual. We lose a dear friend. Hij had nog zoveel plannen. Het mocht niet zo zijn. Kees will be greatly missed. Our deepest sympathy to Kees van der Werf's family and friends. 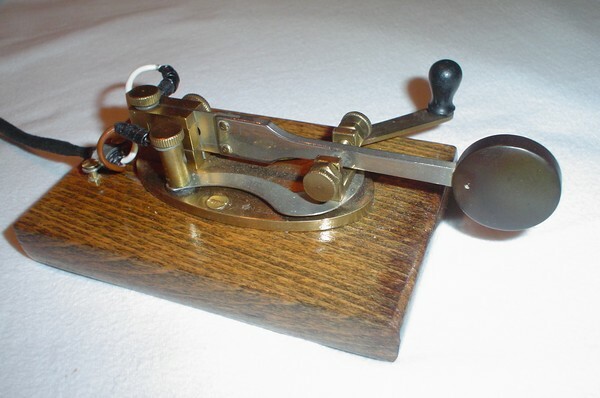 A group of Radio Amateurs using Morse code have established several informal radio nets to promote the use of the sideswiper, so called "cootie" key. These devices have a single horizontal lever with contacts on either side. The operator forms dots and dashes by pushing the lever to either side. Code from the sideswipers can vary from 5 to 30 words per minute and are much less tiresome to use as compared to vertical lever hand telegraph keys. Listen to the mentioned nets and you will find a nice sounding Morse code. All sideswiper users are warmly invited to take part in our nets. At other times, sideswiper aficionados can be found on the recommended calling frequencies. NCS = Net Controlling Station. Region 3 = Asia - Pacific region. (1) = US Standard Time (NOV-MAR). (2) = US Daylight Saving Time (MAR-NOV). (3) = EU Standard Time (OCT-MAR). (4) = EU Daylight Saving Time (MAR-OCT). Number of unique visitors to this web site. Since March 2010: 349976 Today (UTC): 35 Online now: 4 Visitors' locations.